GROUP COACHING - Mental Toughness Inc. If you are looking to expand your mental toughness, but are not yet ready to commit to private mental toughness coaching, Group Coaching could be the perfect fit. Group coaching provides you with something a little more private, intimate and personalized than a workshop structure, while still minimizing your cost per session and allowing for maximum face-time with an expert mental toughness coach. These sessions can be customized to suit the needs and abilities of your specific team, and are adapted to where you are in your season or performance schedule. Athletes will learn hands-on from one another, discover that they actually share a lot of the same fears, and learn how to work through them together. Need proof that it works? Prior to the start of one of our group coaching programs, the athletes in the group reported competition fear levels of 8-10 out of 10 (with 10 representing “terrified” and 0 representing “not scared at all”). When re-polled after only 3 months of bi-weekly group coaching, the same athletes rated their fear at a much lower 2-4 out of 10! Why does Group Mental Toughness Coaching work so fast? Trains your group to support and hold one another accountable for developing your mental toughness by completing the scheduled toughness training assignments. Accountability training using our innovative, self-monitoring Get Psyched App that’s packed with exercises and tactics to help you up your ‘game’. Unlimited email support for coaches and athletes —to help you give your team that extra little confidence boost when you need it most. Mantras, cheat sheets and proven exercises—to help develop the mental edge of every member on your team, so they can Perform On Purpose™. Training on the Get Psyched App, to keep up your training in between sessions. Let’s face it: It’s not simply your physical skill that holds you back from achieving your peak potential—it’s often your inability to handle the pressure and perform in clutch situations. That’s where working with a Mental Toughness Coach comes in. We’re here to help you identify what’s holding you back, to give you tools to push you past your limits, to be your personal cheerleaders, and to help you reach your goals faster than you ever could on your own, all by accessing and unraveling the power of your mind. Group coaching provides a more economical way for athletes to take part in mental toughness coaching, while still providing them with a more individualized and intimate training environment. The athletes in the group are also trained to support and hold each other accountable for completing the scheduled toughness training assignments and for utilizing the mental toughness tools when needed. The coaching is tailored to the needs of the group, and it has been our experience that your needs often mirror that of the group. And if they do not, there is always time to provide some extra coaching specific to each athlete. Just like with our private Mental Toughness Coaching, Group Coaching works according to our ‘ACE’ Training process: Awareness, Coaching, Elevation. We follow the same process with each athlete and each group, however the topic of each session is determined by the needs of the group. You complete the Intake Assessment Form. You work with your Mental Toughness Coach to design the group program (location, duration, frequency, topics) that best suits your needs. Your mental toughness coach coaches the group following either a weekly or bi-weekly schedule, either in person or over Google hangout. You are asked strategic questions to draw out any performance barriers and to provide your coach with the feedback to determine which tools will be the best fit for your needs. Your mental toughness coach gives out toughness training assignments at the end of each group coaching session. You are held accountable for your toughness training and are debriefed on its effectiveness during at the next group session. Your teammates/group-mates also hold you accountable to doing the homework in between sessions. You and your coach engage in ongoing communication via email or text as needed. Your ongoing mental toughness training is also supported by the Get Psyched App. We determine the needs of the mental toughness coaching group by asking very specific and specialized questions using our distinct phenomenological method. This method allows us to best uncover each athlete’s mental barriers within the group context. It is our philosophy that your perspective dictates your reality: In other words, your perspective dictates how you feel and subsequently the actions you will take and the results you will achieve. So our coaching comes directly from what you describe and what you need versus from us guessing at or generalizing your needs based on previous athletes. Show you how to monitor your own training using our innovative Get Psyched App that’s packed with exercises to help you get out of your own way—so you keep progressing even between group coaching sessions. Plus you’ll get unlimited email and text support. What do you do to make sure I’m engaged in between sessions? We assign a specific Toughness Training assignment at the end of each group coaching session based on your needs. This assignment challenges you to incorporate the mental toughness tools that you’ve learned into your performance. We ask that you look out for and remind one another to use the tools in training and competition, so that you all win. 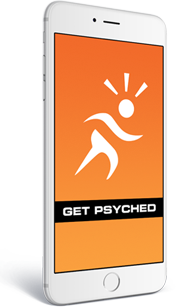 We developed an iOS app called Get Psyched App to provide further tools and training in between sessions and to help prepare you to get psyched for any upcoming performance. And of course your Mental Toughness Coach is always available via text or email for any questions or concerns in between coaching sessions. The Mental Toughness Group Coaching programs were designed with your time in mind – we know that you have a lot on your plate as an elite high performer, therefore we developed these group programs to be as easy to consume as possible. We typically come to you for group coaching, or we all meet online which save travel time and easily inserts into your regular schedule. We designed most of the toughness training assignments to integrate with your current training and performance schedule, so that training your mind does not take up a lot of extra time. Since Mental Toughness Coaching literally trains you to get out of your head, you will worry less and have more time to focus on other things that are important to you. We have coaching programs that fit all budgets. We work with you to tailor your coaching program to your specific budget and performance goals. And, Group Coaching is definitely a cheaper alternative when compared to private coaching. We work athletes and performing artists as young as 9 years of age and as old as 40+, so age is not really a limiting factor (and in our workshops we work with younger performers still). The main factor is that, regardless of your age, you be the one who is committed to doing the work to train your mental toughness: not your parents, or coaches, or spouse, but you. After all, it is you who will be doing the training, so it is most important that you see the value and that you are willing to do the work to see the results. In short, our Mental Toughness coaches are experts in identifying mental performance barriers regardless of your sport or discipline. What if it doesn’t work? The tools we will provide and the principles you will learn have consistently provided freedom and peak performance to the thousands of athletes we have serviced. So long as you are regularly attending the group coaching sessions, interacting with your coach and fellow group members, and completing the weekly toughness training assignments, then Group Coaching will work for you. And if it does not, just send us an email and we will work with you to determine what else we can do to push you to the next level. ARE YOU READY TO GET FIRED UP WITH GROUP COACHING? What if I’m still not sure this is for me? Start by filling out an assessment form and find out. You are under no obligation, and you might just get what you need by asking your questions. INQUIRE ABOUT GROUP COACHING TODAY!